Every February, Valentine’s Day provides sweethearts around the world with an opportunity to present their object of affection with a symbol of adoration. Express your love and appreciation with a carefully selected gift from The Royal Exchange’s luxury boutiques, where you’ll discover the perfect present to put a smile on the face of your beloved. A romantic weekend escape is a great way to spend some time together, away from the hustle and bustle, and maybe even get a little bit of late-winter sun. Naturally, a new pair of shades is required and Tom Davies’ heart-shaped Love sunglasses provide a glamorous frame for adoring eyes. Keep your plane tickets and euros in good order, with a touch of luxurious style with the Panama long haul travel wallet from Smythson, in soft and tactile calf leather. Gifts don’t have to all be so practical though, and Tateossian has the perfect token of affection with the Belgravia Heart rose gold and garnet necklace – present it to her after a romantic dinner for best results. What better way to add sweet accompaniment to jewellery than chocolate? Paul A. Young’s 72% dark chocolate heart and Love Story Collection chocolates express everything that needs to be said if words fail you in the heat of the moment. The hours spent together will no doubt fly by, so make sure you don’t miss your connection back to the real world with the exquisite Heritage Chronométrie Automatic watch from Montblanc, which is sure to lessen the sadness of returning to the day-to-day. 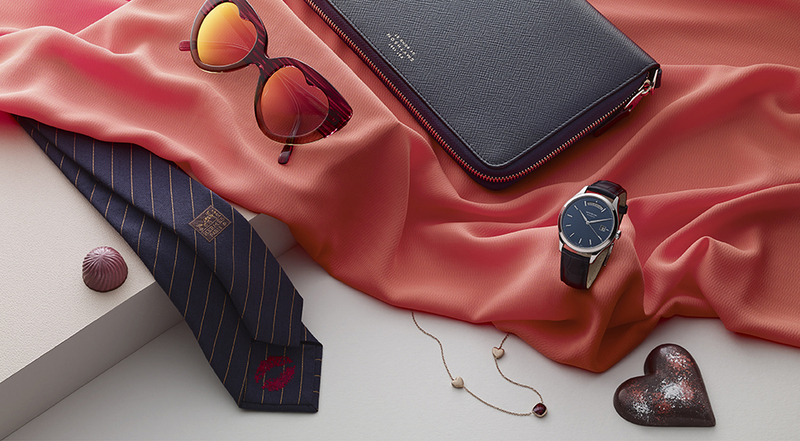 Hermès’ Kiss silk and wool tie has a secret concealed on the back, so you can share a stolen kiss even when you are apart, reminding him of your recent romantic getaway. All of these gifts and more are available at The Royal Exchange.